A decline in bumble bee populations in Europe and North America has been documented in a number of recent publications. Meanwhile, little is known about bee populations in Alaska, where native bee pollination is critical to the maintenance of subarctic ecosystems. Researchers have now completed a two-year study on bumble bees in agricultural areas in the region. Bombus occidentalis pollinates a wild rose in Fairbanks, Alaska. There is little information about bee populations in Alaska, where native bee pollination is critical to the maintenance of subarctic ecosystems. A team from the University of Alaska Fairbanks and the USDA have now completed a two-year study on bumble bees in agricultural areas in the region. The research was published in the Biodiversity Data Journal. Pollination is one of the most fundamental processes sustaining agricultural production and natural ecosystems. While decrease in bee populations is a common concern, most press coverage has been directed towards Colony Collapse Disorder or CCD. 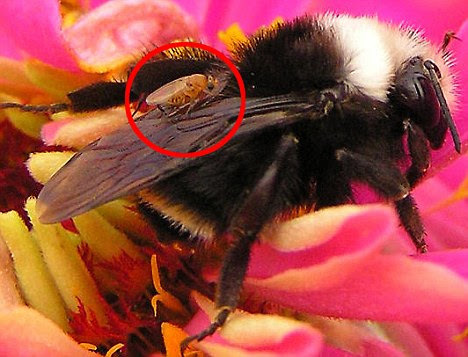 This is a phenomenon that affects commercially managed honeybees. However, wild native pollinators, such as bumble bees, are perhaps even more important for the crops. Alaskan bumble bees, for example, are so well adapted to their environment that they have been observed in temperatures as cold as -3.6°C during snowfall, during the night, and above the tree line. Many of the berries, nuts, and seeds consumed by birds, mammals, and other insects are also a result of bumble bee pollination of native woody and herbaceous plants. There is a real need to monitor bumble bee populations in North America to assess how their populations are faring and if conservation actions are needed. Alaska, the last frontier, is no exception. The new survey represents the first multi-year study on bumble bees from the main agricultural areas of Alaska to provide baseline data on species composition, distribution, seasonal biology, and parasites of the bumble bee genus Bombus. Disturbing trends have been identified in populations of the western bumble bee, Bombus occidentalis. Once considered to be one of the most common west coast bumble bee species, it is now declining in the Pacific Northwest. In Alaska, however, it was collected from all three sites and represented roughly 10% of the total specimens, suggesting that B. occidentalis is a relatively abundant species in the areas studied. Unfortunately, B. occidentalis specimens tested positive for Nosema — a microsporidian parasite linked to recent catastrophic declines throughout North America in the western bumble bee. Social parasites as well as nematodes were also documented in our survey. “This report provides baseline data needed to help understand reported patterns of bumble bee declines in North America,” explains the lead author Dr. Rehanon Pampell. “Additional research is needed to better understand the biology, geographical distribution, contribution of bumble bees to Alaska agriculture, and the possible effects of endo- and social parasites on bumble bees in the state,” she insisted.